Mother Nature’s Backyard features pink and purple flowers. While there are a sprinkling of other flower colors, this theme helps tie together the many plant species featured in our garden. 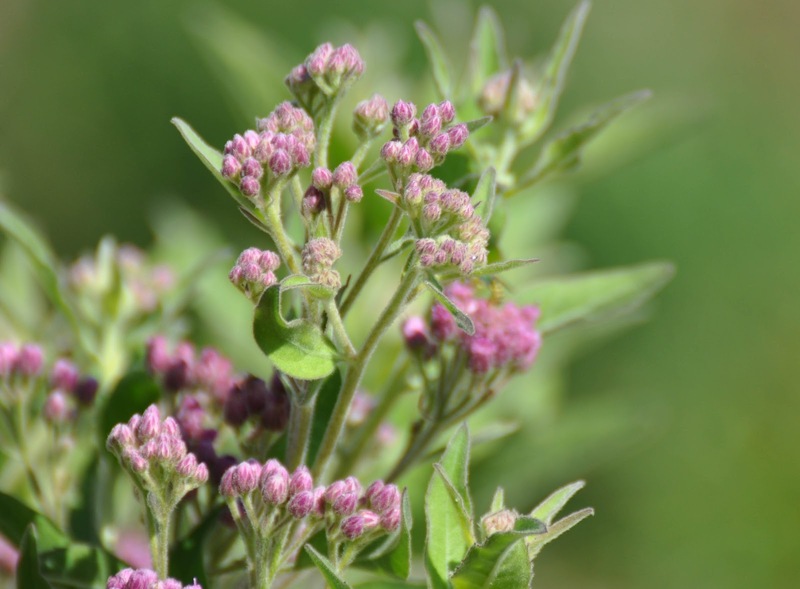 One of our favorite pink-purple species – Sweetscent or Salt-marsh Fleabane – is in peak bloom around our rain garden this month. (pronounced PLOO-shuh oh-dor-AY-tuh) is a plant of moist places including brackish marshes, freshwater springs/marshes and other seasonally moist places. It can be found from the west to the east coast of North America and south to the Caribbean Islands and northern South America. 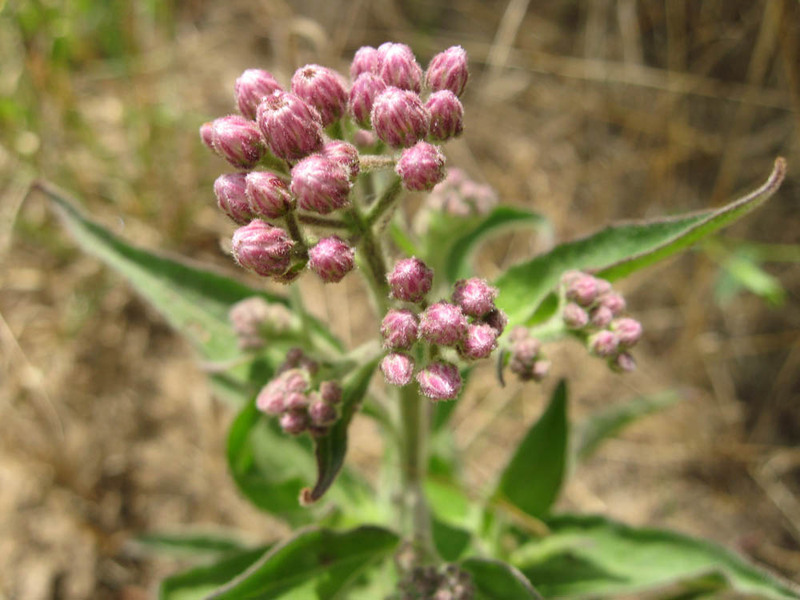 Locally, it grew along streams and marshes in western Los Angeles county and on Catalina Island. There likely were patches of it along the Dominguez Slough and Dominguez Creek. Sweetscent is a member of the Sunflower family (Asteraceae) and its flowers look similar (except in color) to those of Mule Fat (Baccharis salicifolia) another local Sunflower. Pluchea can grow as an annual or perennial, depending on winter temperatures and the amount of summer water. It has rather stout, 2-4 ft upright stems that may become woody at the base but are mostly herbaceous. The leaves are simple, oval to lance-shaped and alternate on the stem. The leaves and stems are dotted with glands that release a mildly camphor-like scent when rubbed or brushed against. To some, the foliage scent is down-right weird. To others, it is a traditional scent associated with our local wetlands. We find it an unusual – but refreshing – addition to our rain garden. One of the best features of Sweetscent is its colors. 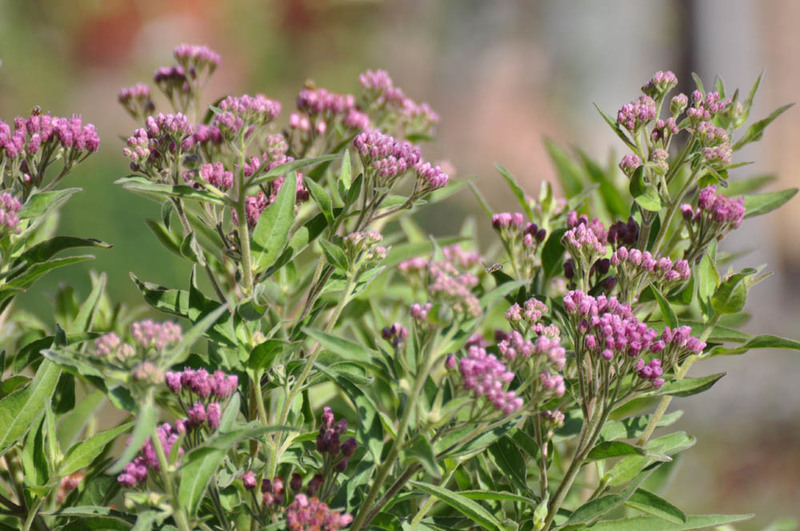 If you like pastels – and your tastes run to pink-purple – you should consider growing this plant. The foliage is a pale green pastel – one of the prettiest greens around. Contrast this with the purple flowers and you have an artist’s dream. Monet would have loved the clouds of pink-violet-purple flowers that seem to float like clouds above the pastel foliage. Like sunflowers in general, Sweetscent has many small flowers that grow in dense clusters (think of the ‘heads’ of sunflowers). As seen above, each flower head includes a number of flat ray flowers surrounding a small number of disc flowers. The heads are grouped in rather loose, flat clusters – located primarily above the foliage. 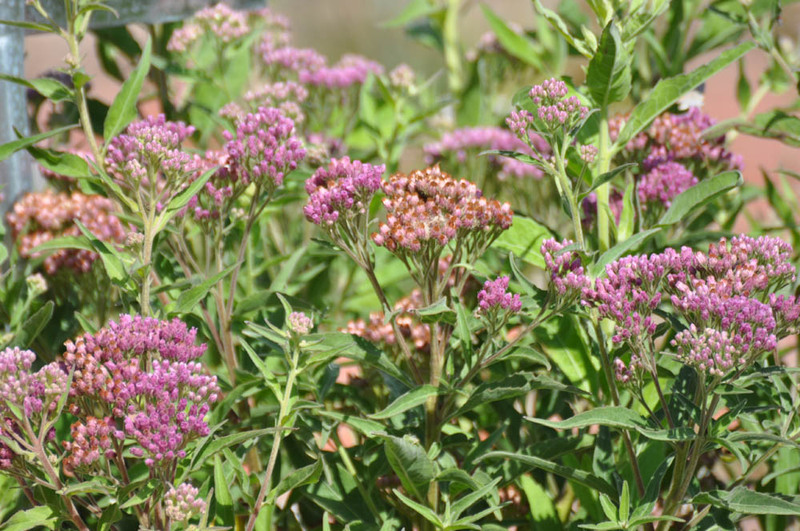 Pluchea blooms from late summer into fall, making it an important color spot in the fall garden. The sweet scent of the flowers – and the abundant nectar – attract a wide range of insects. 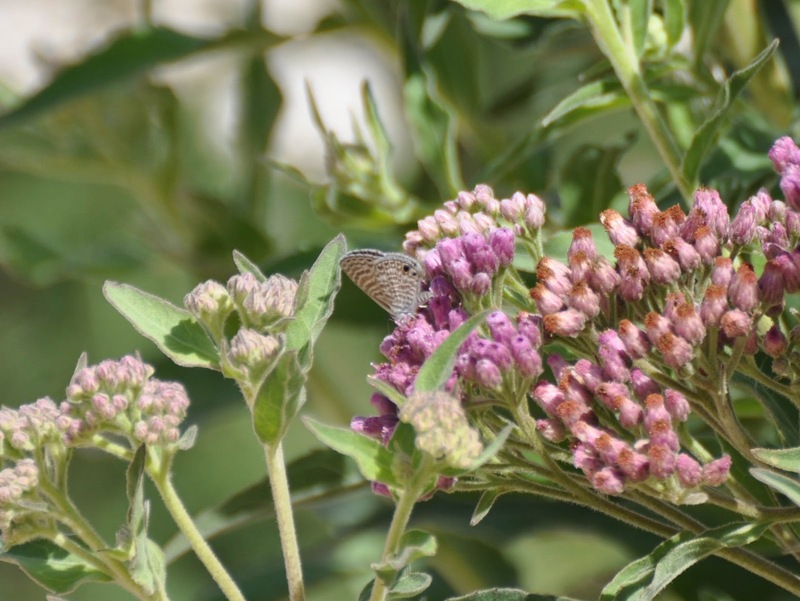 The insect visitors are mostly of the smaller variety: the smaller butterflies like Skippers, Blues and Hairstreaks and native bees and small flies. You can easily spend a delightful hour watching the variety of insects attracted to this plant - so be sure to plan seating close by. 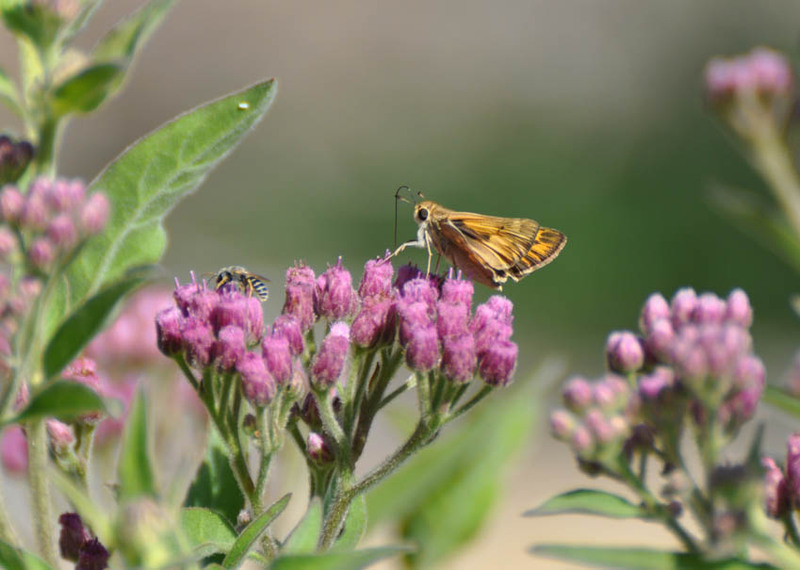 Below are pictures of just some of the insects we saw on a recent morning. We’ll introduce you the Metallic Green Bee in a posting later this month (September, 2012). 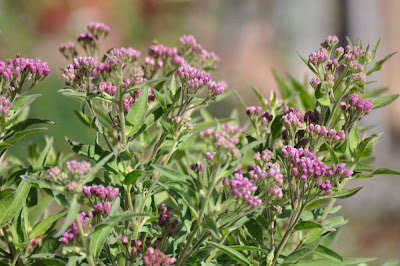 Pluchea will grow in just about any garden soil including those that are alkali and salty. If you have clay soil you’re in luck – Pluchea does very well in local clay soils. Pluchea likes full sun to part-shade. It prefers regular water (Water Zone 2-3 or 3 – see April 26, 2012 posting for more on Water Zone Gardening) although it can take drier conditions once established (occasional water – Water Zone 2). We planted it around our rain garden where it can take advantage of some summer water (we currently water every three days in this part of the garden). This plant can also take the seasonal flooding it will get in the rain garden. Pluchea spreads via rhizomes. In our experience, the spread is not particularly vigorous – but we manage our garden on the dry side which will decrease the rate of spread. If spread concerns you, Sweetscent does fine in a large container. It will thrive around a lawn, pond or any water feature that provides some summer water. It looks right at home when combined with native warm weather grasses, rushes and sedges. It really is spectacular when massed, giving a needed burst of color in late summer and fall. Sweetscent is easy to start from fresh seed.
. The fragrant dried leaves have been used as an insect repellant. They would make a good addition to old-fashioned sachets. Dried flowers are also attractive in floral arrangements.